Rockpool Dining Group’s Fratelli Fresh and Bavarian restaurants are adding a little magic to the winter school holidays, with a jam-packed schedule of fun-for-all activities and family-friendly dining deals. Fratelli Fresh Darling Harbour, the most recent addition to the Fratelli family, is an ideal destination for family outings. The vibrant Italian food and dining emporium is located below the International Convention Centre Sydney Theatre, adjacent to the Darling Park kids’ playground and water fountain wonderland.A fantastic and free school holiday program at Fratelli Darling Harbour is filled with a rotation of magic shows, face painting, workshops and cooking classes, including kids’ pizza masterclasses and gelato decorating. 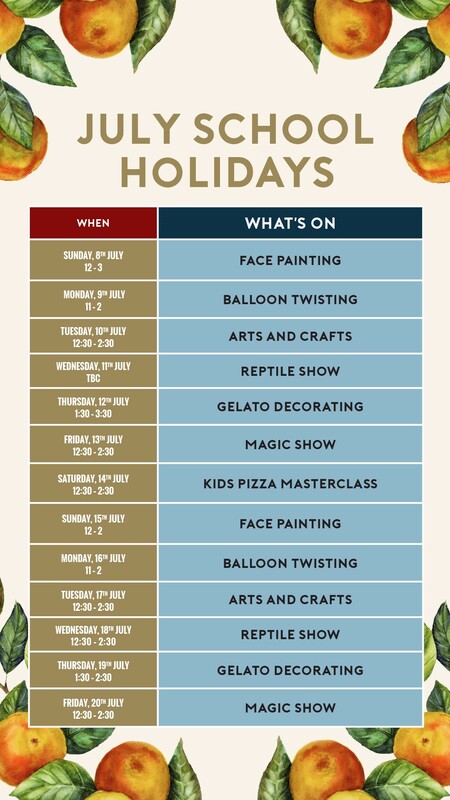 These activities run from Saturday, 7 July to Friday, 20 July and include balloon twisting on Mondays, arts and crafts workshops on Tuesdays, and a reptile show on Wednesdays. On Thursdays, the restaurant will host a playful gelato decorating class, Fridays will see a magician perform wonderful and wacky tricks, while kids will be taught to make their very own pizzas in carefully curated pint-sized masterclasses. See full schedule here. An expansive kids’ menu, also available at Fratelli’s seven other locations, features cheese and tomato pizza, fish fingers, fritto misto and aioli, nonna’s meatballs in tomato sauce and variety of gelato flavours. Every day between Saturday, 7 July and Sunday, 22 July children under 12 can eat for free from the kids’ menu from 12pm and 3pm, at all Fratelli locations. The offer entitles up to four children to eat free with a full-price paying adult. Fratelli Fresh Darling Harbour has a spectacular dessert counter, which is a huge drawcard for family outings. Treats include tiramisu, cannoli, panna cotta, biscotti, banoffee torta, and all 16 flavours of Fratelli’s famous house-made gelato. Customers can choose one scoop, two scoops, three scoops and family friendly tubs in 500ml and 1-litre sizes. Meanwhile, The Bavarian and Munich Brauhaus have ramped up their family-friendliness this winter, inviting kids to eat for free every day of the week from Monday, 25 June to Friday, 31 August between 11am and 3pm. The deal allows one child under 12 to eat for free from the kids menu, with a paying adult. Adult Menu – Loaded Schnitzels at Munich Brauhaus & The Bavarian. One child under 12 can eat for free from kids menu with paying adult. A diverse kids, or “kinder,” menu features mac n cheese balls, chicken schnitzel, The Little Brat hot dog, grilled cheese sandwiches and a classic selection of haus-made gelato in a trio of flavours: chocolate crumble, vanilla and strawberry. Families can also head down to The Bavarian and Munich Brauhaus for free face painting on Sundays. Rockpool Dining Group Chief Executive Officer Thomas Pash said these restaurants were renowned for their welcoming atmosphere, which was amplified during the school holidays. Other Fratelli Fresh restaurants are located at Alexandria, Bridge Street, Crows Nest, Entertainment Quarter, Macquarie Street, Walsh Bay, and Sydney Westfield. The Bavarian can be found at Castle Hill, Rouse Hill, the Entertainment Quarter, Chatswood, Bondi, Manly Wharf, World Square, Miranda, Penrith and Parramatta. The Rocks is home to Munich Brauhaus.